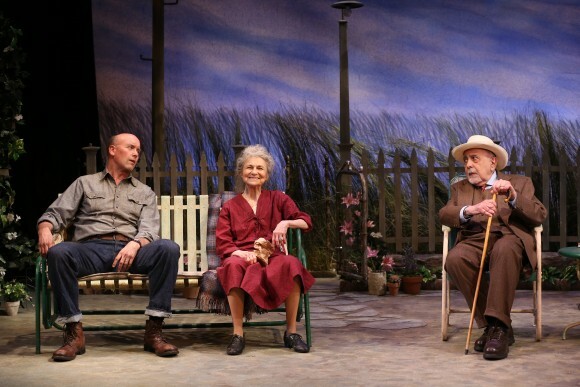 NEW YORK—Life offers second chances, but not always those one expects, as shown in Horton Foote’s quiet 1954 play “The Traveling Lady.” Presented by La Femme Theatre Productions, this rather sweet slice of Americana is currently being performed at the Cherry Lane Theatre. In 1950, Georgette Thomas (Jean Lichty) has arrived in Harrison, Texas, with her young daughter Margaret Rose (Korinne Tetlow). Georgette has traveled there to reunite with her husband, Henry (P.J. Sosko), who will soon be paroled after serving time for a crime committed in a drunken rage. The main attraction of the show is the easy camaraderie between the townspeople of Harrison. Harrison is where Henry grew up and where Georgette hopes the two can start their life together. This will also be a chance for Margaret Rose to finally meet her daddy. Henry had refused to see his wife and child while in jail. While looking for a place to stay, Georgette and Margaret Rose meet up with Slim Murray (Larry Bull), a former resident of the town. He’s recently returned following his own personal upheaval and is staying with his sister Clara (Angelina Fiordellisi) while pondering his future. Taking an immediate liking to Georgette, the two get into a conversation. Slim endears himself to both mother and daughter when he offers to take Margaret Rose to the store for a pack of chewing gum. Among the other citizens of the town Georgette encounters are Clara’s next-door neighbor and close friend Sitter Mavis (Karen Ziemba), who is also caregiver for her aging mother (Lynn Cohen). The elder Mrs. Mavis has been around long enough to witness a good part of Harrison’s history. Also stopping by is Mrs. Tillman (Jill Tanner). A rather proper sort and a staunch prohibitionist, Mrs. Tillman has made it her mission to help others free themselves from the clutches of alcohol. Her latest project is Georgette’s husband, who has been doing odd jobs for her since he got out of jail. This news is a shock to Georgette because Henry has kept her in the dark about his release. Coupled with the show’s underlying theme of starting over is a feeling of finality, and a fear of the unknown. The play opens with a discussion of a funeral and Mrs. Mavis recalls those buried in the old and new sections of the town cemetery. She also finds herself worrying if she has begun to lose her grip on reality, due to her advanced age. Indeed, many of her more caustic comments and actions could be interpreted as either the sign of an aged eccentric, or something more serious. Mrs. Tillman also touches on the passage of time when she remembers how she used to proudly march in the town’s temperance parades—events in Harrison which have long since ceased to be. The main attraction of the show is the easy camaraderie between the townspeople of Harrison, all of whom feel like old acquaintances. Foote set many of his plays in and around this fictional town and as such, imbues them with a strong sense of place and reality. 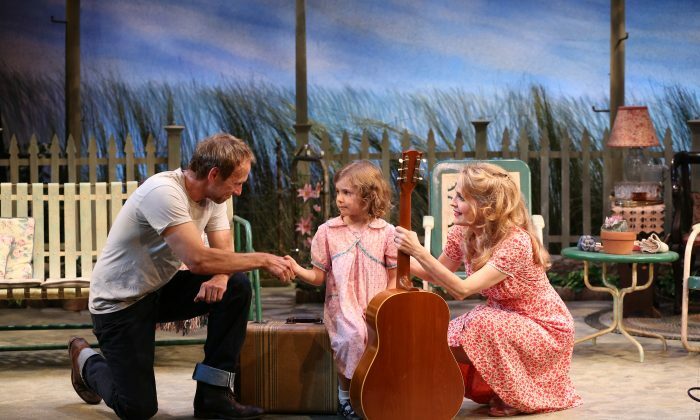 Director Austin Pendleton understands this concept, presenting the show, 90 percent of which has the characters sitting in Clara’s backyard talking, at a smooth, leisurely pace. Though some of the scene transitions— accomplished via designer Harry Feiner’s lighting effects—feel a bit awkward, Feiner’s set design works quite well. Sosko does a great job as Henry, a man battling his addiction to drink and the fear he’s not ready for the responsibilities that come with being a good husband and father. Henry’s eventual meeting with Margaret Rose is particularly heart-wrenching. Bull is steadfast as Slim, a man afraid to open up to anyone except his sister. Fiordellisi and Ziemba project a relaxed air that comes with being long-time friends. Sitter’s situation with her mother is both comic and familiar to anyone who has a love-hate relationship with his or her own parents. Despite a few missteps, ‘The Traveling Lady’ is a quiet and pleasant experience. Cohen gives a strong portrayal of someone tolerated for her antics, but who just might be hiding something darker. Tetlow is delightful as the not-quite-precocious Margaret Rose, who takes great delight in climbing trees. The only cast member not quite in synch with the story is Lichty. Her portrayal of Georgette comes off as somewhat bland. She lacks chemistry with Bull, which blunts the impact of their scenes together, and as a result, certain elements of the narrative don’t seem as natural as they should. 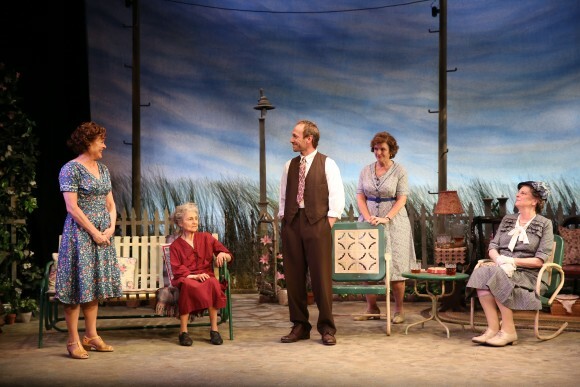 Despite a few missteps, “The Traveling Lady” is a quiet and pleasant experience, with the show offering a gently layered look at a time when the world moved a little slower. Also in the cast are George Morfogen and Ron Piretti.